Contributed by Anna Ryan, Sep 08, 2002 [annaryan001@hotmail.com]. Total records = 147. The route to Drumlish is signposted. Turn right at the crossroads before you enter Drumlish Village. 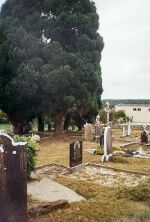 The cemetery is 10 Km from Longford Town. You will find it is not signposted but it can be seen from this road. I walked and read this cemetery Sep 01, 2002. This includes all existing headstones. There may be others without markers. It is a small cemetery. Cooney, Mary, d. 3 Mar 1859, age: 78yr, w/o John, Erected by son Rev. Edward Joseph Cooney -Pastor of the Church of The Immaculate Conception Providence, Rhode Island. America." Cooney, Mary, d. 5 Mar 1859, age: 78yr, w/o John, Erected by their son Rev. Edward Joseph Cooney, Pastor of the Church of the Immaculate Conception. Providence Rhode Island America." Coundland, Elizabeth Ann, d. 9 Sep 1976, age: 79yr Barrabeg. Divine, Elizabeth, d. 4 Mar 1873, age: 74yr, w/o Patrick Erected by son John Divine. New York City. U.S.A.
Flanagan, Rose (Kane), d. 6 Oct 1949, age: 76yr, d/o Patrick Erected by her husband Thomas. Manning, Mary Kate (Molloy), d. 12 Nov 1911, Rathaspic, Co. Westmeath, age: 25yr, d/o Mary and Michael P.
McKenna, James, d. 9 Nov 1962, s/o Bridget and Charles, Drumnacooha ?